President Donald Trump has been using the threat of a border tax in order to try to convince companies to increase domestic production. It has often been a major point of discussion when the President has been dealing with auto industry executives – some are on his advisory council. A new study looked into the possible impact of the proposed border tax on the cost of the vehicles sold by automakers in the US. 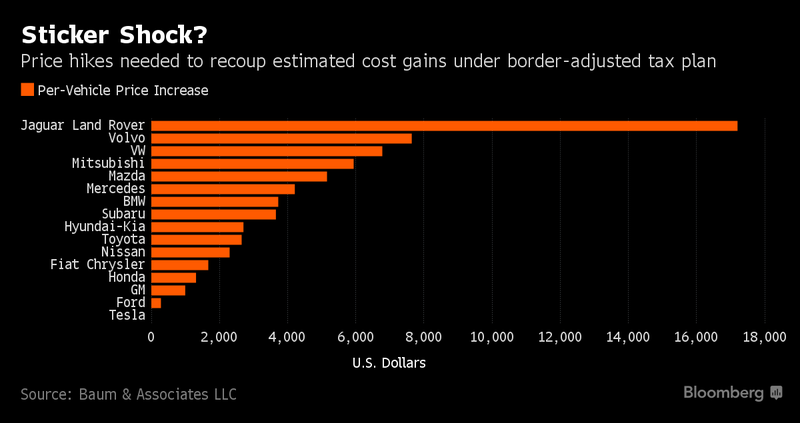 They found that Tesla’s prices would be the least affected by Trump’s border tax among all automakers – foreign and domestic. According to Baum & Associates, if automakers were to make customers pay the entire cost of the border tax, even Ford and GM, two US automakers with significant US manufacturing operations, would see their prices increase on average by $282 and $995 per vehicle respectively. It’s not clear how Tesla would be able to come out without any cost increase since the company also imports some parts from other countries, but all of its vehicles for the US market are assembled in California. Some final assemblies are done in the Netherlands for vehicles to be delivered in Europe. An explanation would be if they already account for the battery cell production at the Gigafactory in Nevada. Those cells are not yet used in Tesla’s vehicles, but once they will be, Tesla estimates that its vehicles will be 95% sourced from the US. Currently, the battery cells are imported by Panasonic and account for a significant portion of the vehicles based on weight, number of parts, and cost. At the very least, it looks like the US price of the Model 3, which is expected to be Tesla’s first vehicle to use the new battery cell produced at the Gigafactory, shouldn’t be affected by a border tax if it is ever implemented by the Trump administration.